Welcome, welcome! 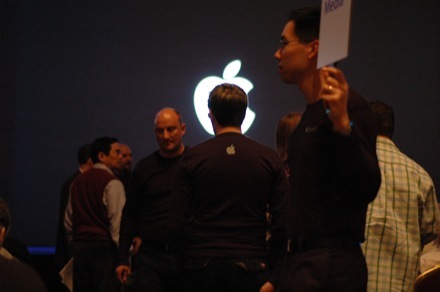 Things aren't yet underway at Apple's Lights Camera Apple NAB keynote event, but be sure to check back here at this post for updates as things get started. We'll be getting underway shortly. 10:30am PST - They've got us in the media corral, we're still a few minutes away from being let in. 10:43am - We're in! They're playing the usual top 40 iTunes tracks: Muse, Franz Ferdinand. Haven't yet heard the classic Apple keynote anthem: Feel Good, Inc. by Gorillaz, but the event is young. 10:48am - There are three terminals up on stage, looks like they brought some backups. 10:49am - Some event handler asked us to close our laptops and put away our cameras! As if! 10:52am - They're playing Neutral Milk Hotel. So according to one of the event staff, this is going to be about 3000 large today. Perhaps we'll see El Jobso. 10:58am - Whoops! Already we've got a flub. 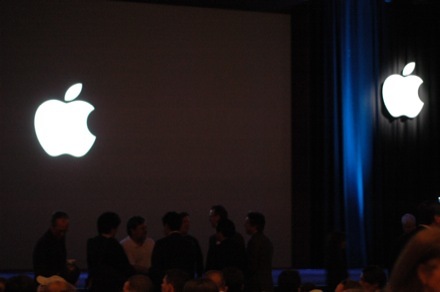 Apple just showed something on screen briefly, but it dropped back to the logo slide almost immediately. 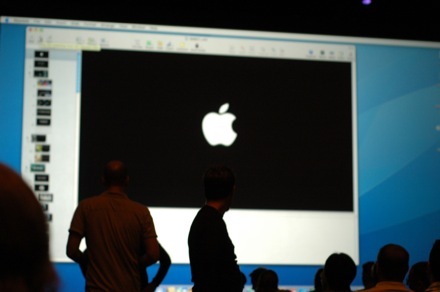 We caught an image, looks like the Keynote presentation. 11:03am - Looks like everyone's in and they're ready to rumble. We should be starting very shortly. 11:04am - Ooh, a bunch of Sony execs showed up. 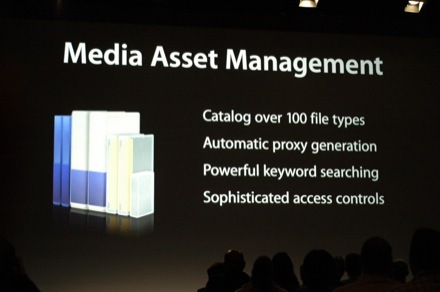 We know Sony is partial to coming to -- even occasionally presenting -- at Apple events. 11:05am - Lights just dimmed, but music still playing. 11:06am - "Ladies and gentlemen, as a reminder, there is no recording of today's event." Umm, ok.
11:08am - Music is done, And here we go. 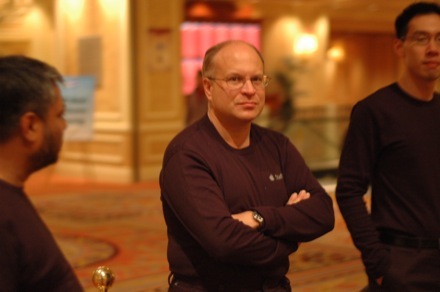 11:09am - Rob Schoeben, VP of Apps and product Marketing. "Welcome, we have a TON to cover today, so I'm not going to to any kind of preamble. Just gonna dive right into it." 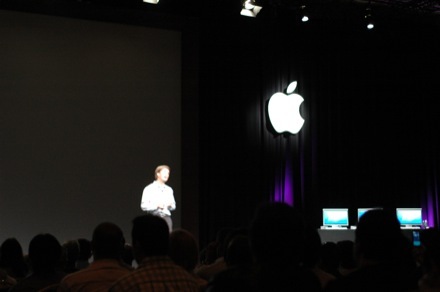 11:10am - "We are now over 800k paid Final Cut users worldwide. By the looks of things, a few of them didn't get in. But a lot of you are here, so thanks for coming." He's going over Final Cut community, books, plugins, all that fun business. 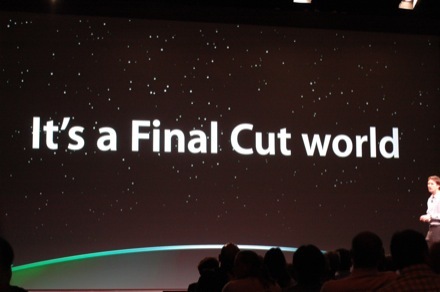 "It's a Final Cut World." Here's a sample.... showing some stuff done in Final Cut. 11:12am - All kinds of movies, TV shows, music videos, all done in Final Cut -- set to the Joey Ramone's cover of "Wonderful World." 11:14am - "We get tons and tons of feedback. Editors live in this software day in and day out. At the same time, there are issues that haunt them. There are massive, massive amounts of content. We have to start working in parallel. What we've done is to combine the feedback we get from our customers with our obsession. 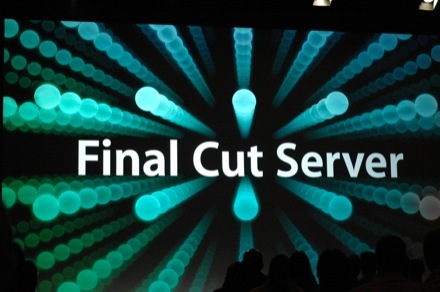 We're introducing Final Cut server." 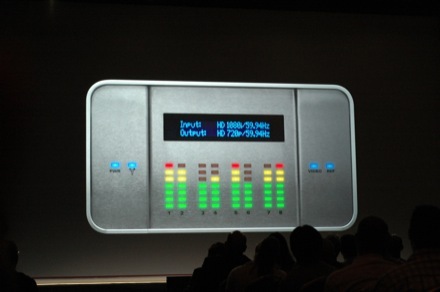 11:18am - "Because we've backed compressor into it, you can control the delivery from Final Cut Server." 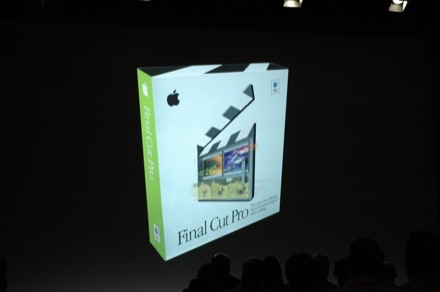 Obviously, it's well integrated with Final Cut, including time-saving shot selection, proxy rough cut... They've been working with CBS 2 News / KCAL 9 in LA. 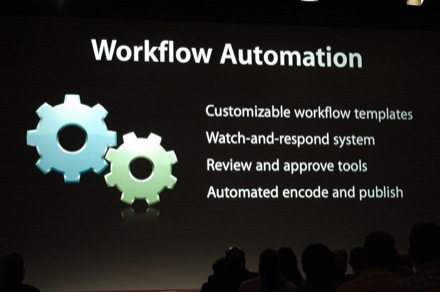 Promo video of their using enhanced workflows with Final Cut Server. 11:20am - Looks like CBS 2 liked it. "Everyone wants to tackle this problem. We thought about how to deliver this product to the marketplace: Let's be really aggressive. It's $999 with 10 concurrent users -- 99 bucks a seat to solve this problem. If you have more people to get involved in the process, for $1999 it's unlimited concurrent users. All you need is this piece of software, add as many as you want. You have licenses for everyone. Available this summer." 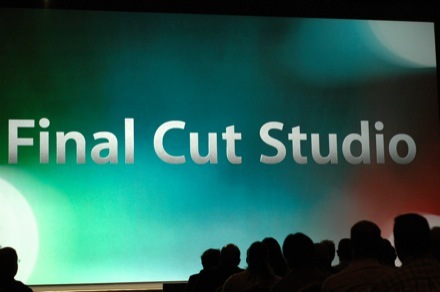 11:23am - "Let's turn our attention to Final Cut Studio. We've been working hard to make this the biggest upgrade we've ever seen seen in professional applications at Apple. 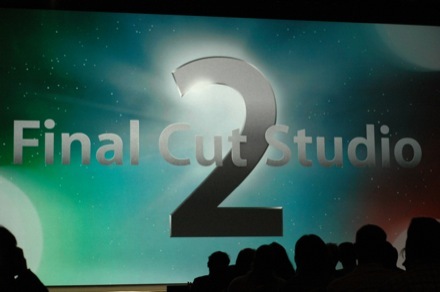 Final Cut Studio 2. 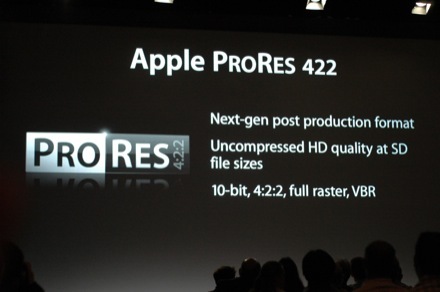 Final Cut Pro is version 6, and we're introducing ProRes 422." 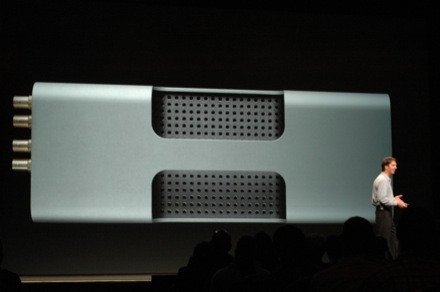 Can compress full raster HD quality video from 1TB to 170GB. 11:24am - Bandwidth efficient, portable, color space headroom, and next gen device support. 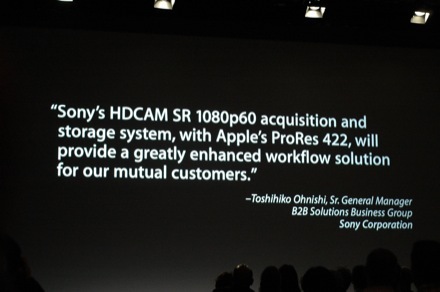 Including Sony's new HDCAM SR 1080p60 storage system introduced here at NAB... that explains those Sony peeps! 11:25am - "Not only are we working with the leaders, we're working with.... "[Applause, RED slide comes up.] 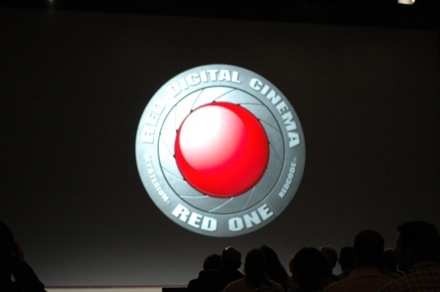 Showing a RED 4k demo. 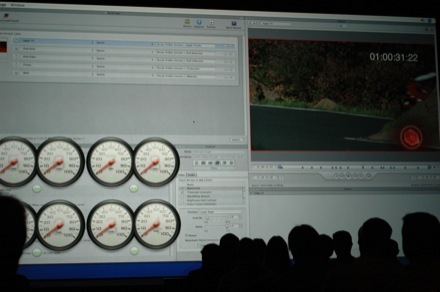 11:26am - "You can take 4k files, plug it directly into a MacBook Pro, and see and edit them right there. The industry is going to change. You will be able to work with this whole new breed of moviemaking." 11:27am - "Clearly it's going to be an interesting show this year." You need something with a bunch of ports in the back, you need a handle, and you need a whole bunch of linking lights on the front. "We turned to our friends at AJA." It's called the IO-HD. 11:30am - Video: "You can edit HD on location on your MBP -- it's everything in and out from ProRes. It's really a new paradigm in post-production. It's really made possible by Final Cut Pro, ProRes, and the IO-HD . 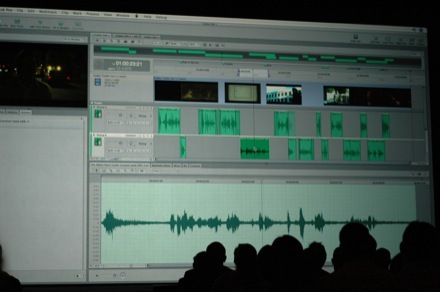 I think it's going to be another Apple earthquake that shakes things up in the post-production industry." 11:31am - It will be introduced at $3495 -- "About a fifth of the cost of competing system. That's ProRes 422. We think this format is coming out of the gate really strong. Talking about formats: we heard you. Open format timeline. Mixed formats, resolutions, framerates." 11:32am - "We took some of the great technology in Shake and brought SmoothCam down to Final Cut Pro, removes camera shaking. Now we also have editable Motion templates, access Motion templates without leaving FCP, update all instances without having to use Motion. It's all integrated." Paul Saccone on stage now demoing. 11:34am - Auto upscaling of lower-res clips, resolution and bitstream independent -- showing 960 x 720 5Mbps video upscaled right next to 1080p at 125MBps. Oohs and aahs. 11:36am - Showing new Motion integration, not having to leave the app to access Motion templates, text overlays, adding motion projects, etc. Unrendered video with effects and overlays previewing totally unrendered. Not shabby! 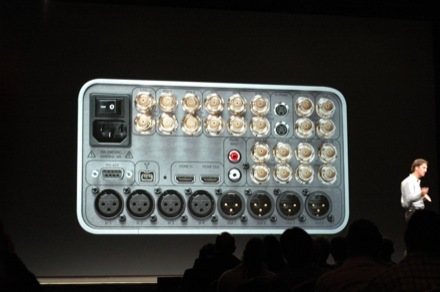 11:39am - We introduced effects plugs -- they've added dozens of them. GPU-accelerated realtime playback of filters and effects. Switching over to ProRes -- comparing ProRes and uncompressed video, 127MBps vs 19MBps. "Visually indistinguishable." The screen is split between the two formats, looks pretty freaking amazing. 11:41am - "We're just getting started. Going to turn my attention now to Motion 3 -- this year we're embracing 3D, extended all the familiar tools into cameras, light sources, navigation of 3D space... create the kind of graphics you want to create. We're adding paint. Particles, video, pictures, pen -- speed, pressure sensitivity -- and throw behaviors on the strokes to bring that paint to live. Something shockingly complicated in the past is now easy: match moving." 11:43am - "Track, match, and move on. Retiming is a powerful tool, but is too complicated. We've married retiming with behaviors, and created the exactly the kind of retiming effects you want. It will dramatically change how you think about retiming. Next up: audio behaviors. Control anims by volume and frequency. To take a quick tour of the new Motion, I'd like to introduce Dion Scoppettuolo." Demoing new Motion features. 11:46am - Syncing 3D animation to audio behavior, looks super easy. Now he's applying tracking behavior to motion tracking with highlight points -- attach animations and overlays directly to frame tracking points incredibly easily. "But I know that's not the kind of 3D you came to see. Reach under your chairs, there are 3D glasses." Har har! 11:52am - Showing 3D camera perspectives, layer lists with virtual dolly pullups, sweeping behaviors, paint tools ("to add a swoosh -- that's a technical term. "), all kinds of crazy 3D video editing effects. Editing particle systems, vector effects and graphics -- "you have a nice little checkbox here... 3D. Click on that, the particles appear in 3D." 11:54am - Big applause. "So that's a quick look at the new Motion. Let's turn our attention to sound. 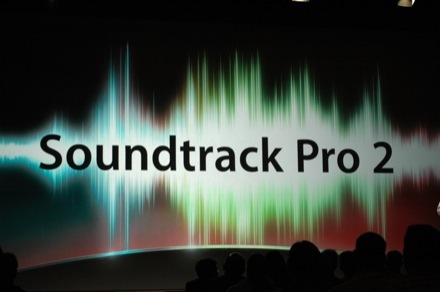 Soundtrack Pro 2. Aligning sound effects and audio with a 3-up video HUD. 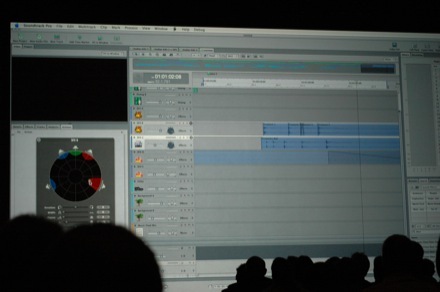 Advanced take management with composited audio tracks. Also embraces surround mixing at its core -- one of the key things, we do this in a single project, stereo and surround mix encapsulated in the same project." 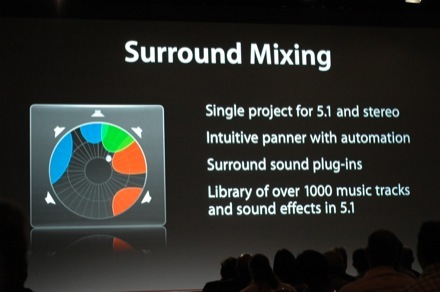 5.1 support, panning and speaker-to-speaker automation. 11:56am - "The incredible new Conform feature. Change tracking, sync changes, difference highlights, accept or override..." Alec Little to demo now. 12:02pm - Fade selector tool, built-in waveform editor -- including a frequency spectrum view. 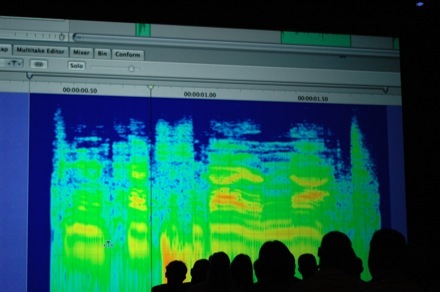 Draw a box around the problem frequency -- delete a portion of sound. He just perfectly removed a bump in a mic from an audio track during dialogue! Daaaamn. Perhaps we should get this for the Engadget Podcast. 12:07pm - Take editor -- making a comp, select which portion of which take to use. Just grabbed four soundtrack takes and instantly composited them. Demoing sound effects, syncing sound effect with a video HUD, quickly synced a royalty-free sound effect in under 10 seconds. Demoing Conform feature -- new edits with cut (or added clips) that would otherwise take hours with a bunch of sound effects and bites can now be pushed through rapidly with grouped approvals of intelligently re-synced edits. 12:14pm - All six channels are included in one clip, so you don't have to deal with multiple tracks when working with 5.1. Showed final clip, audio sounds really amazing, and the whole 30 second preview was just created in a few minutes. "Now I'm going to turn my attention to Compressor 3. It's now a major marquee member of the Final Pro suite. It's industrial strength." It now features simplified cluster setup, extended to MPEG-2, H.264, Telestream Episode Pro plug-in with VC-1, WMV, FLV... dynamic filters with timecode overlays, animated motion watermarks. 12:16pm - With a Mac Pro 8-core with this sample it will take us 16:45 in Compressor 2. In Compressor 3 it's down almost 3x to 6:02. I've encoded a 10 minute clip in less than ten minutes. Compressor 3 demo time. 12:20pm - Easy to use preset list that covers "pretty much any device on the planet you'd want to export to." Custom default presets, drag groups of batch preset encodes. 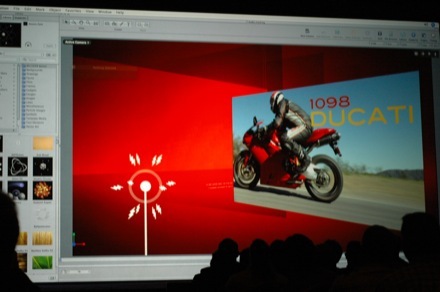 Preview overlays and watermarks with a before and after slider. Integrated chapter markers. 12:23pm - Easy to spread multiple threads across as many processor cores as you want -- demo shows octo-core encoding jump to 100% across all eight cores. Shows live bookmarks in video, publishing to iTunes. All done! 12:24pm - "Compressor rounds out the new Final Cut Studio 2. As you see, we've put our attention to the delivery side. All these products are included: still $1299. We've also made it really easy to upgrade, the move to FCS2 for $499. 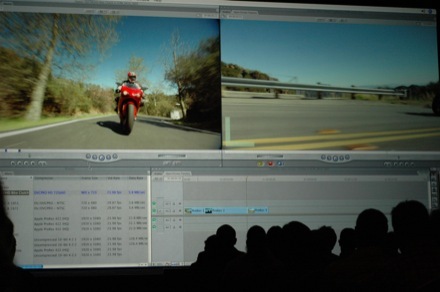 We've made it just $699 upgrade for any version of FCP from the beginning." 12:25pm - Final Cut Studio is available next month. "Let's go back a ways to NAB 1999." Shows crappy old box... "I know, we MADE that box! It's weird. We learned. 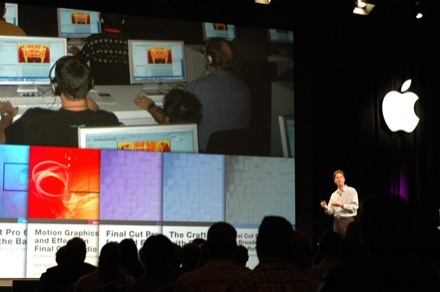 Pro quality editing workstations cost upwards of $100k back then -- we wanted to bring that power to everyone. A democratization of the editing process." 12:27pm - "We want to do for color grading what we've done for editing. We're introducing a new application today: Color. Real time application color grading. I want to turn our attention to FCP editors the Coen Brothers." Showing a colorization demo from the Coen. Stylized color in O Brother... brownificated. 12:30pm - "Color is revolutionary and helpful. It seems calculated to appeal to us, we make movies from beginning to end." 12:31pm - "It's designed to be a natural extention of FCP. 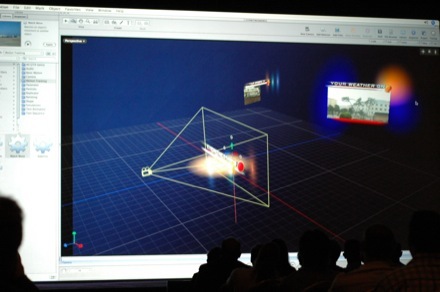 Same UI for 3-way color correction with RGB and luma curves, lift, gamma, gain, visualization of color in 3D space. Mattes from chroma, luma, saturation, custom vignettes, hue and saturation curves. Color effects -- string them together with a node tree. And Geometry. Bring all four of these things together and get what you want: a signature look." 12:32pm - Demo from David Gross, FOX Australia. 12:40pm - Showing gradients and multiple secondaries. Auto-balance tool for contrast, color, etc., and makes automated colorization adjustments. Drag and drop grades from clip to clip. #d scope, all the pixels representation of pixels in a frame. "It's like a lamp post, the lights at the top and the shadows at the bottom -- with a ring of color. Selects a 3D cage around the colorized pixels. Easily dragging the colors and changing whole portions of eyedropped video with keys and vignettes. 12:48pm - Supports custom shapes for colorization effects, not just circular and square. Now color effects. All these effects / look presets are easily exportable and emailed between editors. "Definitely going to become the weapon of choice for all the editors I know." 12:50pm - "Thank you. I hope David charges by the project, not by the hour. We wanted to do for color grading what FCP did for editing. First, you have to have a great product. There's only one answer: to include it in FCS2." Big applause. 12:51pm - "I had a weird feeling you were going to like that part. 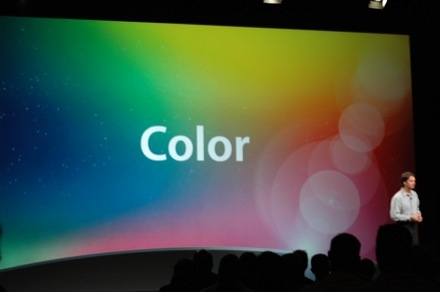 But now everyone can use color as a powerful tool in the editorial process. Now FCS2 includes all the applications I talked about before, and now includes Color. Editing unleashed. Recap: we think we've done our job." 12:52pm - Showing the final reel -- looks like we're almost done! 12:53pm - Yup, that's it! They're even playing "Feel Good Inc." as everyone walks out. 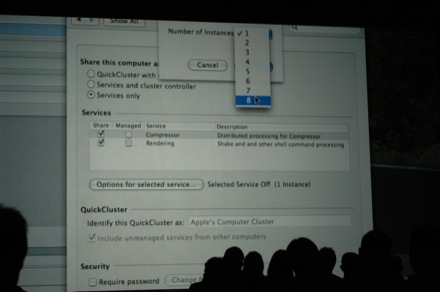 We're pretty sure that its performance is mandatory at Apple events.